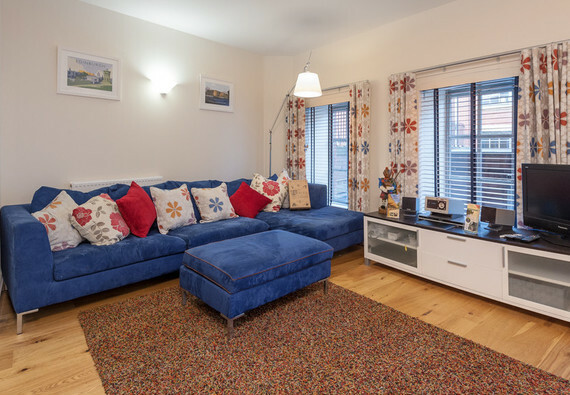 Get ready for some stylish fun at The Patriothall Residence, a vivacious and vibrant 2 bedroom property in the heart of Edinburgh’s ever so hip-and-happening Stockbridge area. Kick off your shoes and relax in this seriously chic and cool space before you head out to soak up all the city has to offer. This apartment’s undeniably fabulous features promise that you will want for nothing, and include heated towel rails (a decadent luxury after an early morning shower), blu-ray player, Wii console and games, and free underground parking. The spacious, open-plan lounge and dining area is a real wow-moment, decorated in warm, eclectic hues. A stunning, electric blue sofa simply demands to be snuggled upon, and you’ll feel truly pampered as you put your weary feet up on the matching foot stool. The lounge is entertainment central on your trip to Edinburgh, as it features a flat-screen television and blu ray player perfect for late-night movie marathons or early morning cartoons to keep the little ones entertained. An inclusive Wii console completes the entertainment bonanza, so we can promise that you’ll certainly not be bored if our typically indecisive Scottish weather keeps you inside! Beautifully polished laminate flooring stretches throughout, extending into the kitchen and dining area, giving the whole space a modern, laid-back appeal that we’re simply head over heels for. A cosy dining area within the lounge comfortably seats four, and ensures that you have the perfect space to nibble on some freshly-baked croissants and plan the best route to uncover all of Edinburgh’s secrets. Make your way through to the kitchen and you’re spoiled for space. Ample cupboards wait to be filled with tasty treats and snacks and a fabulous amount of preperation space means that the whole family can help you prepare a lovely home cooked meal - if you can tear them away from the sofa! The kitchen also features all those mod-cons that just make our lives that little bit easier, including a washer-dryer and a dishwasher, so you’ve more time to sit back, relax and spoil yourself. Now, let’s be honest - is there anything more wonderful than a really, really good night’s sleep? No? We thought not. The Patriothall Residence certainly aims to please, with two double bedrooms complete with adorable, homely decor and plentiful guest storage. You’ll have a sleep quite literally fit for royalty on incredibly soft Hypnos mattresses, which are rumoured to also be used in her Majesty’s royal abode. Sink into a world of comfort, pleasant dreams and warm, sleepy mornings. The master bedroom also features an ensuite bathroom and shower, while a family bathroom lies just along the hall. An oasis of tranquil white tile and sleek chrome, the bathroom is home to a combination bath and shower, so whether you like a long soak or a steamy morning shower, we’ve got you covered. Of course, we can’t forget the heated towel rails, and we’re willing to bet that you won’t either. The local area of Stockbridge is a lively, vibrant haven for foodies and culture-hounds alike. Known as Edinburgh’s Bohemian Quarter, it’s a place where artists, musicians, poets and writers have long made their homes. A city centre area with a delightful village ambience, we dare you not to fall in love with Stockbridge’s classic antiques shops and boutiques. Why not nip in to a quaint little teahouse for a warming cup of Earl Grey on a blustery Scottish day, or chase away the chill with a designer ale at one of Stockbridge’s long-established basement pubs? If you fancy taking a stroll into the City Centre, then you’re a mere fifteen minute walk away from the bustle of Princes Street and the elegant charm of George Street’s restaurants and designer offerings. As with all of our properties, this apartment is strictly non-smoking. Accessibility statement This apartment is on the ground floor, however has 5 steps up to the main door.